This is the tenth international medical conference supported by the foundation of Simon M. Yu, MD. The conference is a extended collaboration of medical professionals of the 2015 Conference: Curing the Incurables. 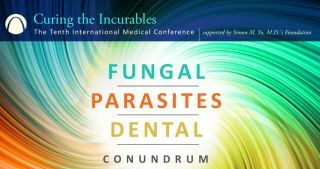 Dr. Yu has organized the professionals from various medical modalities to address the parasite, fungal, dental conundrum. Review the presenter file on the Homepage of this website to see professionals with expertise in parasites, fungal aspects of disease and the tooth/body connection. All recordings shipped to North Carolina will have 7% tax added.